The ICMDS is the latest release in the Minspec range of inclined screens, features include ease of installation and maintenance. The screen is excited by twin circular motion Uras out of balance motors bolted directly to the side plates. 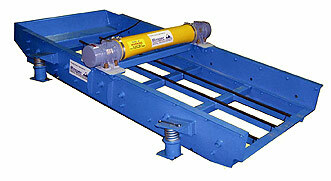 This feature eliminates the need for a torque tube, eccentric shaft, bearing assemblies and motor v belt drive. This type of arrangement is easier to maintain due to the elimination of daily greasing of bearings and labyrinths. The side plates are grade 250 steel stress relieved and c/w drip angles, stiffeners and spring brackets. The deck frame cross members are made from hollow section, after fabrication and weld testing the deck frame is stress relieved. Will be cross tensioned either in woven wire or polyurethane to the customers requirements. The feed box will be lined with bolt on liners extended to overlap first panel to ensure no spillage down back of panels. The discharge lip is protected by Minspec 40 rubber liners.